WOW, that's really the only way to describe Week 13 in the NFL. The amount of shock that went across the league when the Eagles defeated the Patriots 35-28 in Foxboro was astounding. I, an Eagles fan myself thought for sure that the Patriots would come back just because that's what they do. 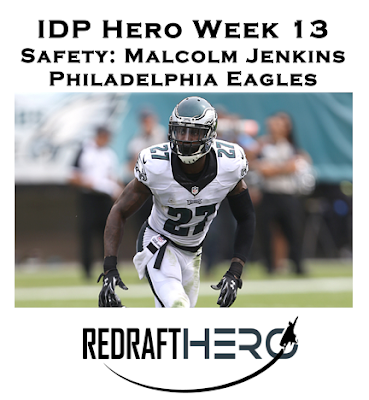 Instead, the Eagles offense and surprisingly Sam Bradford were able to step up and make a big play to shut it down. Not only that, but the Giants blew a lead against the Jets, another 4th quarter blow up for the G-men and the Redskins lost to the lowly Cowboys on Monday night creating even more havoc in the NFC East. 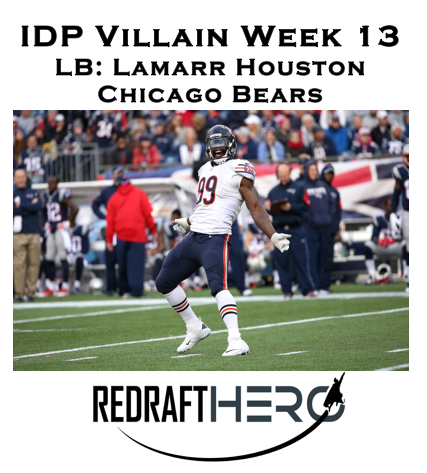 Villain: The Chicago Bears came into the season without any expectations, they had a new coach, a new offensive system, and a new way of playing. A lot of experts expected them to finish with only 3-4 wins and be set up for another high draft pick. They have come out this season surprising everyone and standing at 5-7 with an outside chance at the playoffs. This week though they had a legitimate chance at 6-6 going up against the 49ers and Blaine Gabbert. The Bears did what they do best and blew the chance for the win and then gave up a huge TD pass, which is somewhat surprising seeing how Chicago has done so well with holding teams to short plays this year instead of huge gains. The 49ers and specifically Gabbert, ended up making huge plays with his arms and legs all day and that just can't happen. It did though and one reason is that Lamarr Houston played poorly and recorded only 1 tackle in the game. Overall, great game by the Eagles and Jenkins. 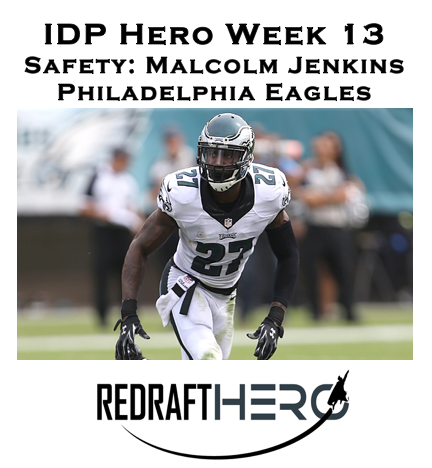 Make sure to check out Redraft Hero and their IDP contests.